Have you ever wondered who made this website? Well, our excellent web developer of course. Every single site that’s on the Internet had someone design it. Web developers usually work on such aspects as layouts, colors, user-friendliness, technical elements and a plethora of other things. According to Glassdoor, on average front-end developers earn more than $80,000. If competition for top tech talent is fierce, the average wage can climb above $100,000. Some web developers even study psychology to understand better how users behave. So, they use or abuse those behavioral patterns on their websites. All of this sounds great, and you might be wondering How to become a web developer yourself. The web development field is exciting, requires a mixed skill set, and there’s always something new to learn or implement. However, during the late 1990s and the early 2000s, web development was a niche. People were like, why do I need a website? I would never buy anything online. Now, web development is the forefront of the digital revolution. So, what does it take to become a web developer and how to learn web development? Keep reading because this guide explains everything you need to know to get you started. If you’ve got your goals set on becoming a web developer the first order of business is building up all of the necessary skills. I recommend choosing a programming language and getting familiar with it. Once, you learn 1 specific language really well, it’s going to be much more comfortable learning other languages. The language you start with will have a direct impact on the job you’ll be doing. However, I was interested in how to become a web developer you might say, what sort of other jobs are you talking about? Well, web development is a broad spectrum. You might work with interface design, mobile application development, front-end development or back-end development. Knowing at least 1 of these web development aspects will already land you a job. The more of them you master, the more desired employee you become. So let’s go over the different languages you can start with, focusing mostly on front-end development. HTML & CSS are the foundation of any website. HTML is used to represent content on the site, and CSS is used to style this content. In other words, you post stuff using HTML and make it pretty using CSS. The best place to learn HTML & CSS development right now would be BitDegree. Their interactive HTML & CSS course has excellent pacing, a lot of practice, and cover a vast scope of information. You can go through this course in a day or two. After completing the interactive HTML&CSS course on BitDegree, I recommend you give Jon Duckett’s HTML and CSS: Design and Build Websites book. It’s a paid resource. However, the book will provide you with a great crash-course through HTML, CSS and some web design secrets sprinkled in. The book is an excellent addition to any future web developers bookshelf. Also, yes, you should still read books. The internet hasn’t entirely taken over yet. 1. Use BitDegree or other learning platforms as a resource to learn web development. 3. DO NOT SKIP CODING ASSIGNMENTS. While working with CSS, you’ll start experimenting with different colors and color schemes. Picking the right colors can make or break your projects, and if you’re not a master designer just yet. I recommend you use premade color schemes. 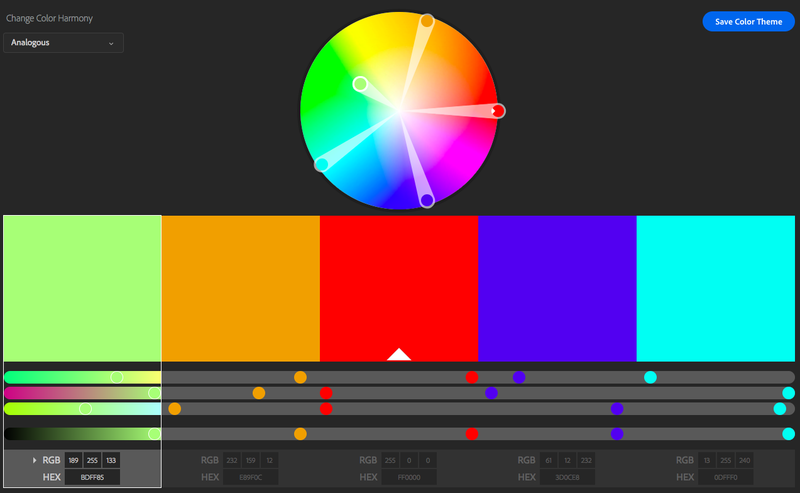 Adobe has a great selection of various color schemes that you can use while creating your website. Utilizing just a couple of colors during development will make your site looking more visually appealing. Because mixing too many colors might make your site look like a nightmare that came back to haunt users from the 1995 era. Also, if you want a specific color, but aren’t sure how that color looks in the code you can use the Adobe color picker tool. Just pick a color and copy the HEX code. Afterall, the design is a crucial part of the daily struggle that web developers go through. So, having some understanding design principles will help you improve if you want to learn web development in the front-end of the website. 1. Use BitDegree as a resource to learn web development. 2. Don’t cheat and copy paste coding assignments. 4. DON’T SKIP CODING ASSIGNMENTS. Fun fact, HTML & CSS aren’t actually programming languages, but they’re usually referred to as being programming languages. In short, GitHub allows you to make changes to the website’s code, without affecting the site before you made sure everything is working smoothly. Most workplaces use GitHub as a communication and development tool, so getting yourself familiarized with GitHub get’s you one step closer to becoming a web developer and learning web development. It’s also nice to have the safety net of GitHub, knowing you can reverse changes if something goes critically wrong. Your experience with GitHub will prepare you for the workspace, where you’ll need to collaborate with other team members. So, any way you cut it, mastery of the GitHub platform is a desirable skill to have.